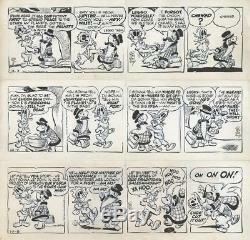 Pogo by Walt Kelly Three (3) Original Strips from the same sequence! Published October 3rd, 7th & 8th, 1959. Featuring Howland Owl and Churchy LaFemme as diplomats to outer space. It was OUR patent FIRST to spread PEACE to the stars! Making fun of the fact that the Bear (allusion to Russia) made it to space first. If only Kelly were still around to poke fun at our most recent politicians! In good condition, the original blue pencil line is evident. There are the usual pin holes top-center where Kelly had pinned it while inking. The paper is a bit off-white with age. They were originally lightly folded between the center panels, which is hard to see when under glass. Great detail work in the characters and costumes they wear. Thanks for considering this great artwork! The item "Pogo by Walt Kelly Original Daily Comic Strips (3) 10/3/59, 10/7/59, 10/8/59" is in sale since Saturday, December 09, 2017. This item is in the category "Collectibles\Comics\Original Comic Art\Comic Strip Art". The seller is "picassotrader" and is located in Santa Rosa, California.